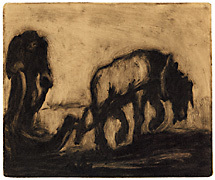 The Plow Man - - c.1920, Monotype. 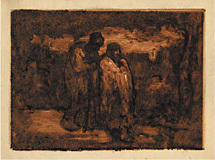 Signed and annotated monotype in pencil, verso. Edition unique. Image size 4 15/16 X 5 15/16 inches (125 x 151 mm). 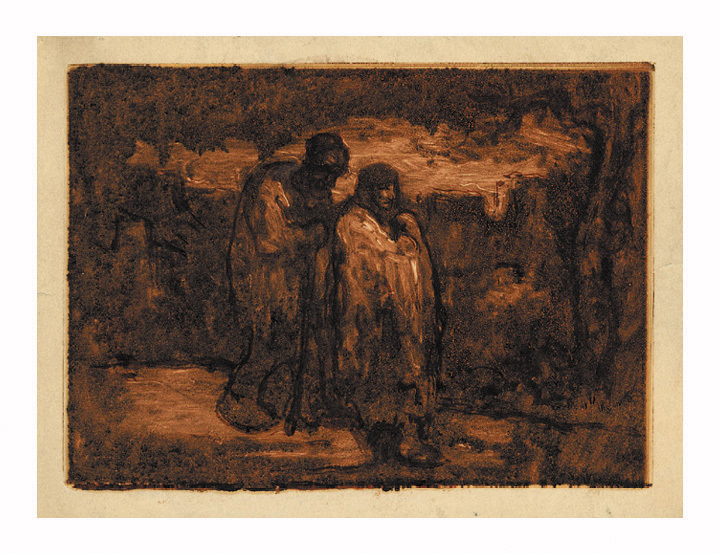 A superb painterly impression, in dark brown ink, on buff wove paper, trimmed to the image edge by the artist. Tape remains on the top sheet edge verso, otherwise in excellent condition. Ex-Kennedy Galleries with the original gallery mat and label. 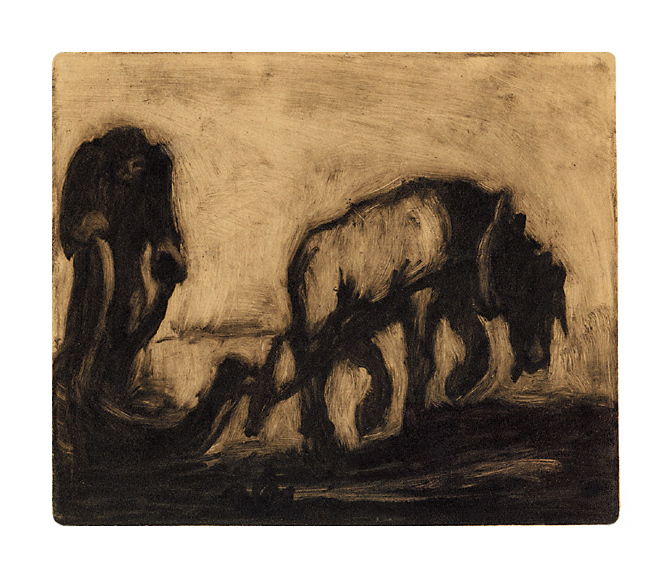 Peasant Couple Walking - - c.1920, Monotype. Image size 5 11/16 X 8 inches (144 x 203 mm); sheet size 6 11/16 x 10 1/2 inches (170 x 267 mm). A superb painterly impression, in sepia brown ink, on buff wove paper, with margins (3/8 to 1 3/8 inches). Tack holes in the sheet edges; losses in the right sheet edge, well away from the image; repaired tears in the margins, not affecting the image; surface soiling and glue remains in the margins; otherwise in good condition. 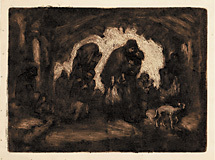 Shelter for the Night - - c.1920, Monotype. 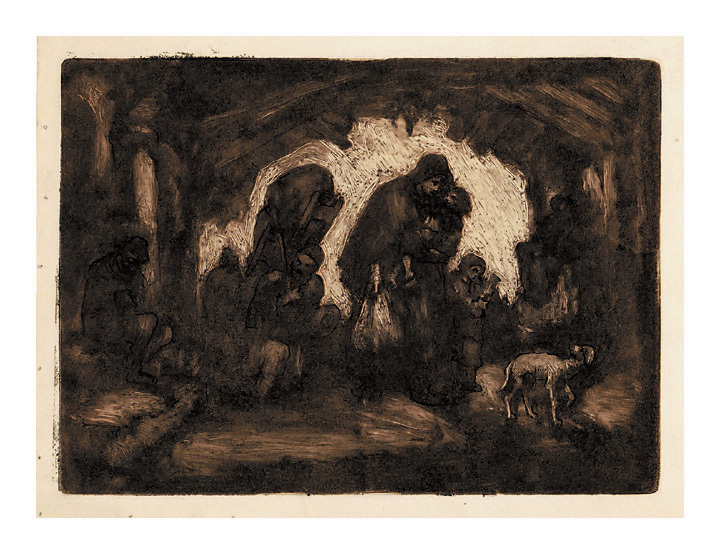 A fine painterly impression, in dark brown ink, on buff wove paper, with margins (1/4 to 1 inch). Tack holes in the sheet edges; printing ink in the outside right margin, well away from the image; otherwise in excellent condition. 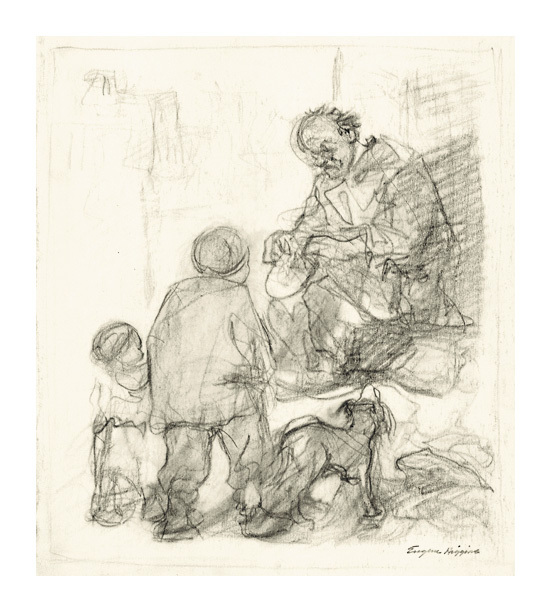 The Shoe Repair Man - - c.1935, Pencil on paper. Image size 10 7/8 x 9 3/8 inches (276 x 238 mm); sheet size 12 3/8 x 10 3/4 inches (314 x 273 mm). 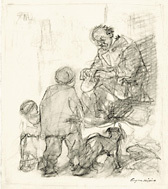 An expressive gesture drawing on heavy off-white bristol, with full margins (1/4 to 1 inch); original hinge remains on the top sheet edge, well away from the image; otherwise in excellent condition.